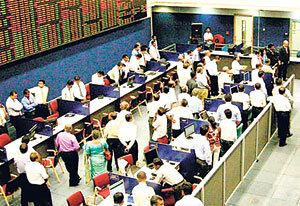 Trading at the Colombo Stock Exchange (CSE) came to a standstill this morning, following a power failure at the World Trade Centre, in Colombo. Trading was halted for some 20 minutes, before it resumed again at around 10.15 a.m.
Sri Lanka is currently undergoing over 7 hours of scheduled power cuts since Monday on a daily basis, which followed a nationwide blackout on Sunday which again lasted for over 7 hours, the longest in some 20 years. The generators at the World Trade Centre had reportedly failed to work due to a technical issue which resulted in the entire twin towers losing power supply.